From a Peterson High School Alumnus: Believe it or not, Abq Jew managed to escape ... er, graduate ... actually, be graduated from high school - Peterson High School in Sunnyvale, California, Home of the Pirates - without ever studying Biology. Which only means that Abq Jew never had Mr Baer as a teacher. But Mr Baer was the Faculty Leader of Peterson's branch of the California Scholarship Federation (CSF), which is how (see, fittingly, The Walk of Life) Abq Jew came to know him. Moreover, everyone knew Mr Baer. He was the guy with the perpetual smile on his face. 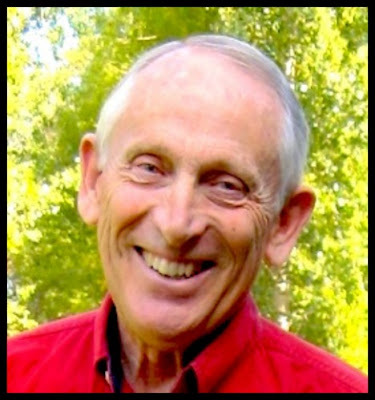 Harry Daniel Baer, 81, died Saturday morning, Sept. 30, 2017 in St. George, Utah. He was born July 30, 1936 in Seattle, Washington to Harry and Dorothy Baer. Dan married Evelyn Smith on August 7, 1959 and they were sealed for time and all eternity in the Idaho Falls, Idaho temple of The Church of Jesus Christ of Latter Day Saints. Dan “Danny” Baer spent most of his adolescence running around the Coleman Fish Hatchery in Anderson, California where his dad was the general manager. Hunting and fishing were standard daily activities, which gave Dan much of his early love for nature and all of God’s creations. He attended Anderson High School, graduating in 1954 as president of his senior class. Dan started his college career at Shasta College and then to Chico State University where he focused his studies on Geology. He then transferred to Brigham Young University, where he finished his degree and met Evelyn. After graduation and their marriage in the summer of 1959, they moved to San Jose, California where Dan earned his secondary education teaching credential at San Jose State University and began teaching at Marian A. Peterson High School. He would later earn his Master’s degree in Biology from San Jose State University. Dan worked as a high school science teacher at Peterson High from 1961 [actually, around 1965] until 1982. It was during this time that he wrote a grant to the State of California that resulted in the building of the one-acre nature area at Peterson and the beginning of the Montebello Ridge program, an alternative section of courses that focused students on natural California history, including several annual river and camping trips along the Pacific coast, Sacramento River and Lassen National Park. Hundreds of students' lives were changed and inspired through this program, whose members are affectionately known to this day as the “Ridge Rats”. Dan ended his teaching career at Wilcox High in 1991. Dan and Evelyn retired to his old stomping grounds in Cottonwood, California, where they enjoyed life on a small 25-acre gentleman’s farm. The concept of simcha (happiness) is an important one in Jewish philosophy. A popular teaching by Rabbi Nachman of Breslov, a 19th-century Chassidic Rabbi, is "Mitzvah Gedolah Le'hiyot Besimcha Tamid," it is a great mitzvah (commandment) to always be in a state of happiness. When a person is happy, he is much more capable of serving God and going about his daily activities than when depressed or upset. Happy is how Abq Jew will always remember Mr Baer. Sarah Aroeste Sings in Albuquerque!